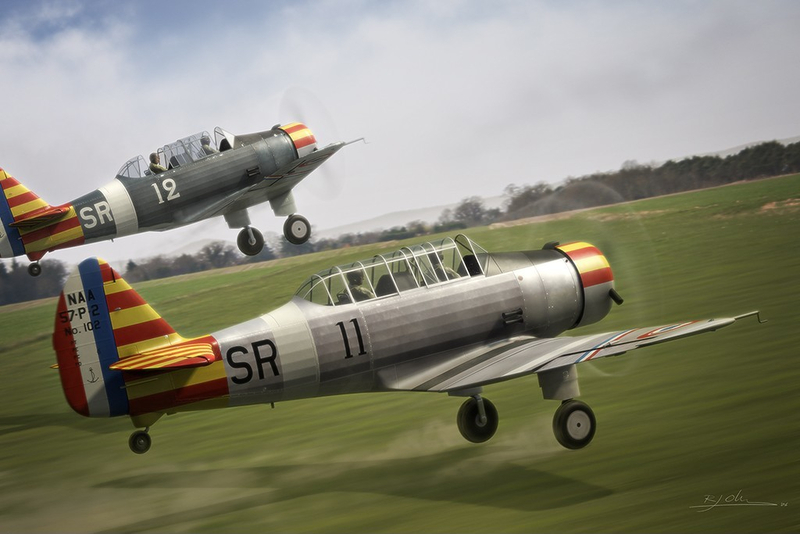 Here's my latest work, a pair of Vichy French aircraft on their take-off run. The aircraft are North American NAA-57-P-2 advanced trainers (predecessors to the famous AT-6 Harvard/Texan), taking off from Fréjus–Saint-Raphaël in the South of France, on what could well be their last flight. It is November 1942, and in a matter of days the Vichy French Naval Air Arm will seize to exist, as German forces occupy the rest of France. The image was inspired by this photograph of Vichy French aircraft at Fréjus–Saint-Raphaël, now under German command, waiting to be scrapped or sold. NB. The white tailband was added directly after the Allied invasion in North Africa on 8 November 1942 and just four days later all French airfields on the Mediterranean coast were taken over by German AAA units. This image was made especially for an aviation art exhibition, Wiek Luijken (Kiwi 123), John Wallin (Capt Flushgarden) and I will have at the [URL="http://www.militaireluchtvaartmuseum.nl/"]Military Aviation Museum[/URL] in Soesterberg, The Netherlands, starting on 24 November and running for well over half a year. Prints of this image are available on [url=http://digitalaviationart.com/Olsthoornprints.html]DigitalAviationArt.com[/url].